These highlights do not include all the information needed to use UROXATRAL safely and effectively. See full prescribing information for UROXATRAL. UROXATRAL is indicated for the treatment of signs and symptoms of benign prostatic hyperplasia. UROXATRAL is not indicated for the treatment of hypertension. UROXATRAL is not indicated for use in the pediatric population. The recommended dosage is one 10 mg UROXATRAL (alfuzosin HCl) extended-release tablet once daily. The extent of absorption of alfuzosin is 50% lower under fasting conditions. Therefore, Uroxatral should be taken with food and with the same meal each day. The tablets should not be chewed or crushed. UROXATRAL (alfuzosin HCl) extended-release tablet 10 mg is available as a round, three-layer tablet: one white layer between two yellow layers, debossed with X10. in patients with moderate or severe hepatic impairment (Childs-Pugh categories B and C), since alfuzosin blood levels are increased in these patients [see Use in Specific Populations (8.7) and Clinical Pharmacology (12.3)]. with potent CYP3A4 inhibitors such as ketoconazole, itraconazole, and ritonavir, since alfuzosin blood levels are increased [see Drug Interactions (7.1) and Clinical Pharmacology (12.3)]. Postural hypotension with or without symptoms (e.g., dizziness) may develop within a few hours following administration of UROXATRAL. As with other alpha adrenergic antagonists, there is a potential for syncope. Patients should be warned of the possible occurrence of such events and should avoid situations where injury could result should syncope occur. There may be an increased risk of hypotension/postural hypotension and syncope when taking UROXATRAL concomitantly with anti-hypertensive medication and nitrates. Care should be taken when UROXATRAL is administered to patients with symptomatic hypotension or patients who have had a hypotensive response to other medications. Caution should be exercised when UROXATRAL is administered in patients with severe renal impairment (creatinine clearance < 30 mL/min) [see Use in Specific Populations (8.6) and Clinical Pharmacology (12.3)]. UROXATRAL is contraindicated for use in patients with moderate or severe hepatic impairment [see Contraindications (4), Use in Specific Populations (8.7) and Clinical Pharmacology (12.3)]. Although the pharmacokinetics of UROXATRAL have not been studied in patients with mild hepatic impairment, caution should be exercised when UROXATRAL is administered to such patients [see Use in Specific Populations (8.7) and Clinical Pharmacology (12.3)]. Potent CYP3A4 Inhibitors: UROXATRAL is contraindicated for use with potent CYP3A4 inhibitors (e.g. ketoconazole, itraconazole, ritonavir) since alfuzosin blood levels are increased [see Contraindications (4), Drug Interactions (7.1) and Clinical Pharmacology (12.3)]. Other alpha adrenergic antagonists: UROXATRAL is an alpha adrenergic antagonist and should not be used in combination with other alpha adrenergic antagonist [see Drug Interactions (7.2)]. Phosphodiesterase-5 (PDE5) Inhibitors: PDE5-inhibitors are also vasodilators. Caution is advised for concomitant use of PDE5-inhibitors and UROXATRAL, as this combination can potentially cause symptomatic hypotension [see Drug Interactions (7.4)]. Carcinoma of the prostate and benign prostatic hyperplasia (BPH) cause many of the same symptoms. These two diseases frequently coexist. Therefore, patients thought to have BPH should be examined to rule out the presence of carcinoma of the prostate prior to starting treatment with UROXATRAL. Rarely (probably less than 1 in 50,000), alfuzosin, like other alpha adrenergic antagonists, has been associated with priapism (persistent painful penile erection unrelated to sexual activity). Because this condition can lead to permanent impotence if not properly treated, patients should be advised about the seriousness of the condition [see Adverse Reactions (6.2) and Patient Counseling Information [17.3]). If symptoms of angina pectoris should appear or worsen, UROXATRAL should be discontinued. The incidence of adverse reactions has been ascertained from 3 placebo-controlled clinical trials involving 1,608 men where daily doses of 10 and 15 mg alfuzosin were evaluated. In these 3 trials, 473 men received UROXATRAL (alfuzosin HCl) 10 mg extended-release tablets. In these trials, 4% of patients taking UROXATRAL (alfuzosin HCl) 10 mg extended-release tablets withdrew from the trial due to adverse reactions, compared with 3% in the placebo group. Table 1 summarizes adverse reactions that occurred in ≥2% of patients receiving UROXATRAL, and at a higher incidence than that of the placebo group. In general, the adverse reactions seen in long-term use were similar in type and frequency to the events described below for the 3-month trials. Testing for blood pressure changes or orthostatic hypotension was conducted in three controlled studies. Decreased systolic blood pressure (≤90 mm Hg, with a decrease ≥20 mm Hg from baseline) was observed in none of the 674 placebo patients and 1 (0.2%) of the 469 UROXATRAL patients. Decreased diastolic blood pressure (≤50 mm Hg, with a decrease ≥15 mm Hg from baseline) was observed in 3 (0.4%) of the placebo patients and in 4 (0.9%) of the UROXATRAL patients. A positive orthostatic test (decrease in systolic blood pressure of ≥20 mm Hg upon standing from the supine position) was seen in 52 (7.7%) of placebo patients and in 31 (6.6%) of the UROXATRAL patients. The following adverse reactions have been identified during post approval use of UROXATRAL. Because these reactions are reported voluntarily from a population of uncertain size, it is not always possible to reliably estimate their frequency or establish a causal relationship to drug exposure. UROXATRAL is contraindicated for use with potent CYP3A4 inhibitors such as ketoconazole, itraconazole, or ritonavir, since alfuzosin blood levels are increased [see Contraindications (4), Warnings and Precautions (5.4) and Clinical Pharmacology (12.3)]. The pharmacokinetic and pharmacodynamic interactions between UROXATRAL and other alpha adrenergic antagonists have not been determined. However, interactions may be expected, and UROXATRAL should not be used in combination with other alpha adrenergic antagonists [see Warnings and Precautions (5.4)]. There may be an increased risk of hypotension/postural hypotension and syncope when taking UROXATRAL concomitantly with anti-hypertensive medication and nitrates [see Warnings and Precautions (5.1)]. Caution is advised when alpha adrenergic antagonists, including UROXATRAL, are co-administered with PDE5 inhibitors. Alpha adrenergic antagonists and PDE5 inhibitors are both vasodilators that can lower blood pressure. Concomitant use of these two drug classes can potentially cause symptomatic hypotension [see Warnings and Precautions (5.4)]. Efficacy of alfuzosin hydrochloride was not demonstrated in a randomized, double-blind, placebo-controlled, efficacy and safety trial conducted in 172 patients ages 2 to 16 years with elevated detrusor leak point pressure (LPP≥40 cm H2O) of neurologic origin treated with alfuzosin hydrochloride using pediatric formulations. The trial included a 12-week efficacy phase followed by a 40-week safety extension period. No statistically significant difference in the proportion of patients achieving a detrusor leak point pressure of <40 cmH20 was observed between the alfuzosin and placebo groups. During the placebo-controlled trial, the adverse reactions reported in ≥2% of patients treated with alfuzosin and at a higher incidence than in the placebo group were: pyrexia, headache, respiratory tract infection, cough, epistaxis and diarrhea. The adverse reactions reported for the whole 12-month trial period, which included the open-label extension, were similar in type and frequency to the reactions observed during the 12-week period. Systemic exposure was increased by approximately 50% in pharmacokinetic studies of patients with mild, moderate, and severe renal impairment [see Clinical Pharmacology (12.3)]. In phase 3 studies, the safety profile of patients with mild (n=172) or moderate (n=56) renal impairment was similar to the patients with normal renal function in those studies. Safety data are available in only a limited number of patients (n=6) with creatinine clearance below 30 mL/min; therefore, caution should be exercised when UROXATRAL is administered in patients with severe renal impairment [see Warnings and Precautions (5.2)]. The pharmacokinetics of UROXATRAL have not been studied in patients with mild hepatic impairment. UROXATRAL is contraindicated for use in patients with moderate or severe hepatic impairment [see Contraindications (4), Warnings and Precautions (5.3) and Clinical Pharmacology (12.3)]. Should overdose of UROXATRAL lead to hypotension, support of the cardiovascular system is of first importance. Restoration of blood pressure and normalization of heart rate may be accomplished by keeping the patient in the supine position. If this measure is inadequate, then the administration of intravenous fluids should be considered. If necessary, vasopressors should then be used, and the renal function should be monitored and supported as needed. Alfuzosin is 82% to 90% protein bound; therefore, dialysis may not be of benefit. Each UROXATRAL extended-release tablet contains 10 mg alfuzosin hydrochloride as the active ingredient. Alfuzosin hydrochloride is a white to off-white crystalline powder that melts at approximately 240°C. It is freely soluble in water, sparingly soluble in alcohol, and practically insoluble in dichloromethane. The tablet also contains the following inactive ingredients: colloidal silicon dioxide (NF), ethylcellulose (NF), hydrogenated castor oil (NF), hydroxypropyl methylcellulose (USP), magnesium stearate (NF), mannitol (USP), microcrystalline cellulose (NF), povidone (USP), and yellow ferric oxide (NF). The effect of 10 mg and 40 mg alfuzosin on QT interval was evaluated in a double-blind, randomized, placebo and active-controlled (moxifloxacin 400 mg), 4-way crossover single dose study in 45 healthy white male subjects aged 19 to 45 years. The QT interval was measured at the time of peak alfuzosin plasma concentrations. The 40 mg dose of alfuzosin was chosen because this dose achieves higher blood levels than those achieved with the co-administration of UROXATRAL and ketoconazole 400 mg. Table 3 summarizes the effect on uncorrected QT and mean corrected QT interval (QTc) with different methods of correction (Fridericia, population-specific and subject-specific correction methods) at the time of peak alfuzosin plasma concentrations. No single one of these correction methodologies is known to be more valid. The mean change of heart rate associated with a 10 mg dose of alfuzosin in this study was 5.2 beats/minute and 5.8 beats/minute with 40 mg alfuzosin. The change in heart rate with moxifloxacin was 2.8 beats/minute. 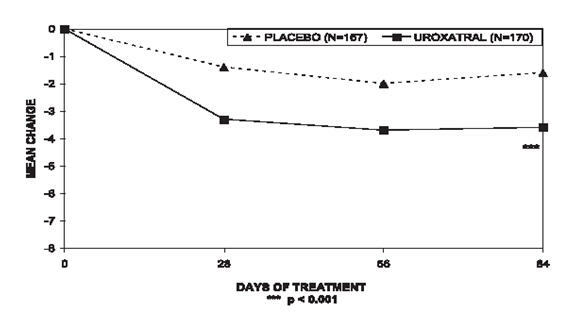 The pharmacokinetics of UROXATRAL have been evaluated in adult healthy male volunteers after single and/or multiple administration with daily doses ranging from 7.5 mg to 30 mg, and in patients with BPH at doses from 7.5 mg to 15 mg. The absolute bioavailability of UROXATRAL 10 mg tablets under fed conditions is 49%. Following multiple dosing of 10 mg UROXATRAL under fed conditions, the time to maximum concentration is 8 hours. Cmax and AUC0–24 are 13.6 (SD = 5.6) ng/mL and 194 (SD = 75) ng∙h/mL, respectively. 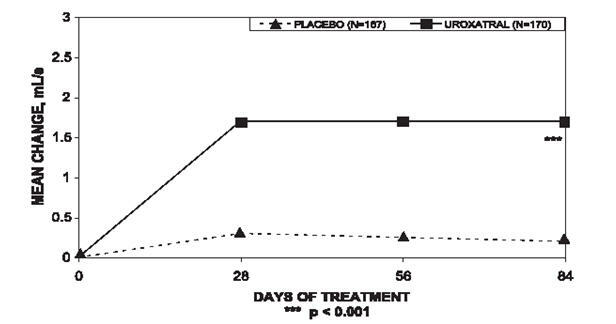 UROXATRAL exhibits linear kinetics following single and multiple dosing up to 30 mg. Steady-state plasma levels are reached with the second dose of UROXATRAL administration. Steady-state alfuzosin plasma concentrations are 1.2- to 1.6-fold higher than those observed after a single administration. 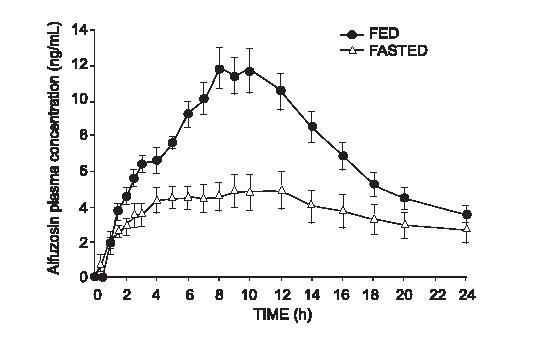 As illustrated in Figure 1, the extent of absorption is 50% lower under fasting conditions. Therefore, UROXATRAL should be taken with food and with the same meal each day [see Dosage and Administration (2)]. Following oral administration of 14C-labeled alfuzosin solution, the recovery of radioactivity after 7 days (expressed as a percentage of the administered dose) was 69% in feces and 24% in urine. Following oral administration of UROXATRAL 10 mg tablets, the apparent elimination half-life is 10 hours. Geriatric Use: In a pharmacokinetic assessment during phase 3 clinical studies in patients with BPH, there was no relationship between peak plasma concentrations of alfuzosin and age. However, trough levels were positively correlated with age. The concentrations in subjects ≥75 years of age were approximately 35% greater than in those below 65 years of age. Renal Impairment: The Pharmacokinetic profiles of UROXATRAL 10 mg tablets in subjects with normal renal function (CLCR>80 mL/min), mild impairment (CLCR 60 to 80 mL/min), moderate impairment (CLCR 30 to 59 mL/min), and severe impairment (CLCR <30 mL/min) were compared. These clearances were calculated by the Cockcroft-Gault formula. Relative to subjects with normal renal function, the mean Cmax and AUC values were increased by approximately 50% in patients with mild, moderate, or severe renal impairment [see Warnings and Precautions (5.2) and Use in Specific Populations (8.6)]. Hepatic Impairment: The pharmacokinetics of UROXATRAL have not been studied in patients with mild hepatic impairment. In patients with moderate or severe hepatic insufficiency (Child-Pugh categories B and C), the plasma apparent clearance (CL/F) was reduced to approximately one-third to one-fourth that observed in healthy subjects. This reduction in clearance results in three to four-fold higher plasma concentrations of alfuzosin in these patients compared to healthy subjects. Therefore, UROXATRAL is contraindicated in patients with moderate to severe hepatic impairment [see Contraindications (4), Warnings and Precautions (5.3) and Use in Specific Populations (8.7)]. Pediatric Use: UROXATRAL tablets are not indicated for use in the pediatric population [see Indications and Usage (1.1) and Use in Specific Populations (8.4)]. In another study, repeated oral administration of a lower (200 mg/day) dose of ketoconazole increased alfuzosin Cmax by 2.1-fold and AUClast by 2.5-fold, following a single 10 mg dose of alfuzosin. Therefore, UROXATRAL is contraindicated for co-administration with potent inhibitors of CYP3A4 (e.g., ketoconazole, itraconazole, or ritonavir) because of increased alfuzosin exposure[see Contraindications (4), Warnings and Precautions (5.4) and Drug Interactions (7.1)]. Diltiazem: Repeated co-administration of 240 mg/day of diltiazem, a moderately-potent inhibitor of CYP3A4, with 7.5 mg/day (2.5 mg three times daily) alfuzosin (equivalent to the exposure with UROXATRAL) increased the Cmax and AUC0–24 of alfuzosin 1.5- and 1.3-fold, respectively. Alfuzosin increased the Cmax and AUC0–12 of diltiazem 1.4-fold. Although no changes in blood pressure were observed in this study, diltiazem is an antihypertensive medication and the combination of UROXATRAL and antihypertensive medications has the potential to cause hypotension in some patients [see Warnings and Precautions (5.1)]. Digoxin: Repeated co-administration of UROXATRAL 10 mg tablets and digoxin 0.25 mg/day for 7 days did not influence the steady-state pharmacokinetics of either drug. Three randomized placebo-controlled, double-blind, parallel-arm, 12-week trials were conducted with the 10 mg daily dose of alfuzosin. In these three trials, 1,608 patients [mean age 64.2 years, range 49–92 years; Caucasian (96.1%), Black (1.6%), Asian (1.1%), Other (1.2%)] were randomized and 473 patients received UROXATRAL 10 mg daily. Table 4 provides the results of the three trials that evaluated the 10 mg dose. Difference between baseline and week 12. Keep UROXATRAL out of reach of children. Patients should be told about the possible occurrence of symptoms related to postural hypotension, such as dizziness, when beginning UROXATRAL, and they should be cautioned about driving, operating machinery, or performing hazardous tasks during this period. This is important for those with low blood pressure or who are taking antihypertensive medications or nitrates [see Warnings and Precautions (5.1)]. Patients should be instructed to tell their ophthalmologist about their use of UROXATRAL before cataract surgery or other procedures involving the eyes, even if the patient is no longer taking UROXATRAL [see Warnings and Precautions (5.6)]. Patients should be advised about the possibility of priapism resulting from treatment with UROXATRAL and medications in the same class. Although this reaction is extremely rare, but if not brought to immediate medical attention, can lead to permanent erectile dysfunction (impotence) [see Warnings and Precautions (5.7)]. UROXATRAL should be taken with food and with the same meal each day. Patients should be advised not to crush or chew UROXATRAL tablets. Read the Patient Information that comes with UROXATRAL before you start using it and each time you get a refill. There may be new information. This leaflet does not take the place of talking with your doctor about your condition or your treatment. You and your doctor should talk about all your medicines, including UROXATRAL, now and at your regular checkups. What is the most important information I should know about UROXATRAL? UROXATRAL can cause serious side effects, including a sudden drop in blood pressure, especially when you start treatment. This may cause you to faint, or to feel dizzy or lightheaded. If you begin to feel dizzy or lightheaded, lie down with your legs and feet up. If your symptoms do not improve call your doctor. See the section "What are the possible side effects of UROXATRAL?" for more information about side effects. UROXATRAL is a prescription medicine that is called an "alpha-blocker". UROXATRAL is used in adult men to treat the symptoms of benign prostatic hyperplasia (BPH). UROXATRAL may help to relax the muscles in the prostate and the bladder which may lessen the symptoms of BPH and improve urine flow. Before prescribing UROXATRAL, your doctor may examine your prostate gland and do a blood test called a prostate specific antigen (PSA) test to check for prostate cancer. Prostate cancer and BPH can cause the same symptoms. Prostate cancer needs a different treatment. UROXATRAL is not for use in women or children. Some medicines called "alpha-blockers" are used to treat high blood pressure. UROXATRAL is not for the treatment of high blood pressure. Who should not take UROXATRAL? are allergic to alfuzosin hydrochloride or any of the ingredients in UROXATRAL. See the end of this leaflet for a complete list of ingredients in UROXATRAL. Tell your doctor about all the medicines you take, including prescription and non-prescription medicines, vitamins and herbal supplements. Some of your other medicines may affect the way UROXATRAL works and cause serious side effects. See "What is the most important information I should know about UROXATRAL?" How do I take UROXATRAL? Take UROXATRAL after the same meal each day. Do not take it on an empty stomach. Swallow the UROXATRAL tablet whole. Do not crush, split, or chew UROXATRAL tablets. What are the possible side effects of UROXATRAL? See "What is the most important information I should know about UROXATRAL?" These are not all the side effects of UROXATRAL. For more information ask your doctor or pharmacist. How do I store UROXATRAL? Medicines are sometimes prescribed for conditions that are not mentioned in patient information leaflets. Do not use UROXATRAL for a condition for which it was not prescribed. Do not give UROXATRAL to other people, even if they have the same symptoms you have. It may harm them. This leaflet summarizes the most important information about UROXATRAL. If you would like more information, talk with your doctor. You can ask your doctor or pharmacist for information about UROXATRAL that is written for health professionals. You may also visit our website at www.UROXATRAL.com or call 1-800-446-6267. What are the ingredients of UROXATRAL? Inactive Ingredients: colloidal silicon dioxide (NF), ethylcellulose (NF), hydrogenated castor oil (NF), hydroxypropyl methylcellulose (USP), magnesium stearate (NF), mannitol (USP), microcrystalline cellulose (NF), povidone (USP), and yellow ferric oxide (NF).